When asked to name the leading threats to online privacy in the future, 51 percent of the global panel of consumers picked “businesses using, trading or selling my personal data for financial gain without my knowledge or benefit”…The survey seems to present a grim outlook for data-driven online businesses and marketers. Facebook is using the passive data — where users go on their PCs and phones — to make its own ads smarter. Advertisers who want to reach Facebook users who are interested in camping, for example, will be able to reach that audience with greater accuracy. “There’s just a more robust set of information that informs that you’re interested in camping,” Mr. Boland said. So is Facebook doomed? Hardly. The truth is few consumers would be willing to pay the price for true privacy. To understand that price, it is necessary to understand why privacy is dead. The first reason that many sites rely on advertising is that it is simply much more lucrative than charging on a per-user basis. 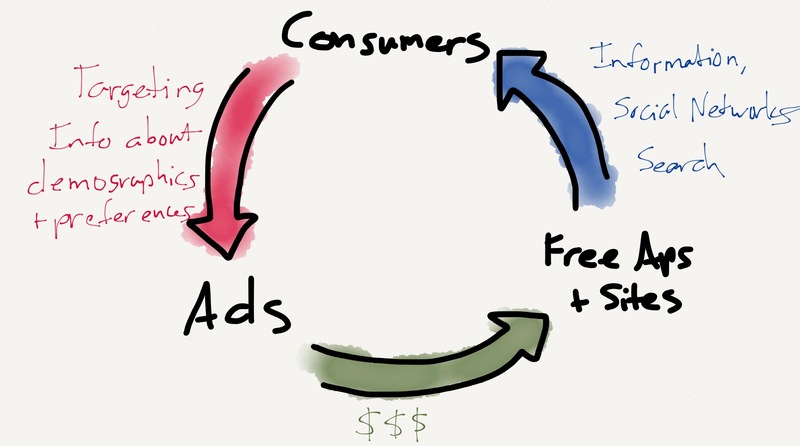 Consider this site: the week I write this, Booking.com is sponsoring Stratechery for $500. If there is a sponsorship every week, that means ~$2,250 in monthly income. I also write the Daily Update for Stratechery members; membership costs $10/month, which means one month of sponsorship has the same income potential as 225 members. To be clear, while I’m very grateful for my sponsors, I greatly enjoy writing the Daily Update and strongly believe in the member-supported model and am determined to make it work. But it shouldn’t be any surprise that for most sites, the advertisement versus member-support decision isn’t really a decision at all: advertising wins. There are other services that can’t even realistically choose between advertising and member-supported. Facebook is a great example: the utility of Facebook is directly correlated with how many people you know who are also using Facebook, and the only way to maximize that number is to make the service free, supported by advertising. Google is in a similar boat: the efficacy of search is in many ways tied to how many people are using search. Queries and clicks are the raw grist for Google improving its algorithm, and the more the better, which means making queries free. The explosion of ad-supported content and ads on the Internet have created a glut of inventory; all things being equal, one piece of inventory is worth the same as another, which is to say worth $0. It’s pricing 101: if supply outstrips demand, the price drops; the flipside of infinite inventory is a price of $0. When it comes to the price sites or apps can charge for ads, though, the key phrase is “all things being equal.” Some sites, like the New York Times, can charge more based on the the perceived quality of their audience and the prestigiousness of the New York Times brand; others, like Yahoo, can offer wide reach with one ad-buy (although this is worth increasingly less because programmatic buying offers the same scale benefits across a wide array of sites and apps). I just noted that Facebook and Google, in order to function, must be free (and thus ad-supported) in order to offer meaningful social networking and better search, respectively. The biggest beneficiaries, though, are the people who actually use Facebook and Google. Facebook doesn’t seem to get much respect in tech circles, but the truth is it has had and continues to have a more meaningful impact on normal consumers lives than any of the various companies and products that actually get tech people excited. As for Google, I’ve used the product countless times just to write this article; it’s exceedingly difficult to imagine how any of us could function without it. A whole host of other sites don’t have to be free, but as I noted above the economics lead them to the ad model; ultimately, though, consumers benefit by having access to an astonishing amount of information without paying anything. It’s fine to argue that content in particular should depend on subscribers, but no one person can subscribe to everything. You cannot take away any one of these components without taking away all of them. Unless we as a society are willing to give up all of the benefits provided by search, social networks, and the free dissemination of information, then we will give up our privacy. The first step towards dealing with this new reality responsibly is coming to grips with the circle I just illustrated: demanding that all users have zero data collected about them necessarily means choking off much of the consumer benefit provided by the Internet. Those who truly wish to opt-out can opt-out of Facebook, Google, etc. (any objections that this would be unpleasant actually makes my point). Secondly, there needs to be an industry standard for anonymizing and aggregating data. All of the relevant players claim they do this sort of anonymization and aggregation, but the effectiveness of their methods are a black box. It should be impossible to tie any of this lucrative information to an individual, and in return, apps and sites that ensure this is the case should receive some sort of imprimatur attesting to their responsibility. Finally, there should be significant resources spent establishing this imprimatur as something worth “paying” for when it comes to consumer attention. Sites and apps should be rewarded for treating information responsibly, with meaningful fines if violations are found. The devil is certainly in the details of this sort of verification system, but the danger of not working through these issues now are more government impositions along the lines of the recent “Right to be forgotten” decision handed down in the European Union. While that decision is not directly applicable to the issue of collecting and selling user data, it ought to serve as evidence that governments will effect change with the blunt instruments of regulation and judicial decree if we as an industry decline to wield our own scalpels. A postscript: from what I’ve heard Apple is going to be making a significant marketing push around privacy; the rhetoric at WWDC certainly suggested this was the case. While this is primarily a strategy credit (i.e. the opposite of a strategy tax), it will be interesting to see just how much of an impact it makes on consumers.